Hello hello! Can you believe it? I have another FO to show you! 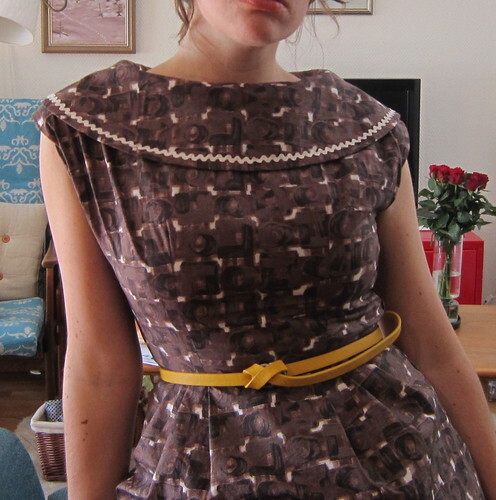 This is a dress that´s been finished a while, but I haven´t had the chance to take any decent photos of it until now. This dress goes under the name The Dissertation Party Dress. Back in May, my darling defended his PhD- thesis, and it is tradition for the new doctor to hold a black tie party for his closest co-workers, friends, family and so. I, of course knew I had to make a dress for the occasion but I didn´t want it to be too dressy, as my man isn´t a black tie- event kind of a guy. So, I went for a cocktail length, dress, rather then a floor length one. The choice fell upon Simplicity 1995, a vintage pattern, because I a)had the perfect fabric for it in my stash, and b) really wanted to try out that dramatic collar look. I used the bodice for dress number 2, but the skirt of number 1. I am kind of in love with this dress. It has a classic wiggle dress shape, but because of the pleats in the front skirt, and the split in the back there´s room both for excessive eating and dancing (believe me, I have tried, and it´s perfect for doing the twist;-)). 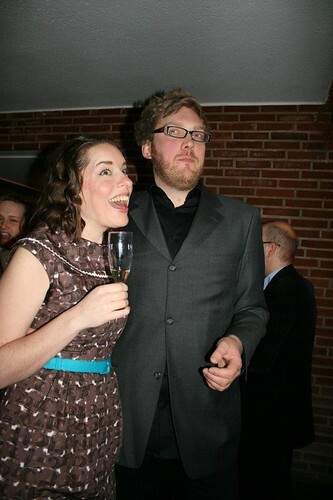 Here´s a shot from back in May, at the party I wore the dress with teal heels, and I made a matching belt, but the belt seem to have disappeared during the Move. Hopefully it´ll turn up again! Brown is a color I used to wear a lot all the way back in high school, and I should add more brown garments to my wardrobe, as it really do work as a great stand in for black. Brown works really well together with some of my favorite colors this season, like warm yellow, teal and rusty reds. 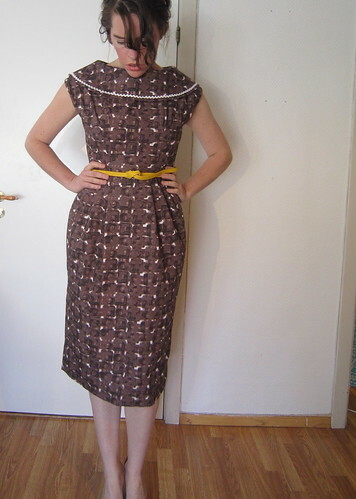 A very clever way of giving more body to the pleats, especially in such a thin cotton that I have used for this dress. 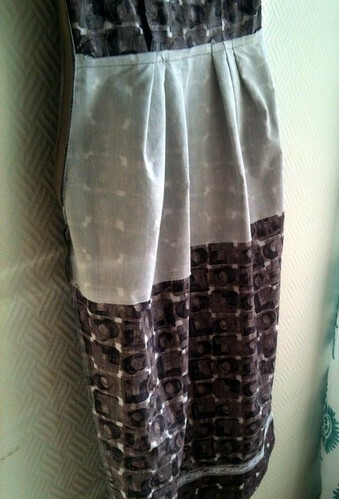 The fabric, by the way, was bought in Paris last December in one of those fantastic Coupons- shops. Oh, Paris. When may I return? 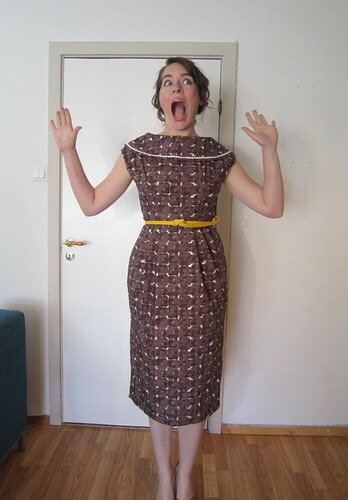 All in all, a fun dress both to sew and wear, and I´ve already got an “order” from a friend of mine that she wants one too! What a gorgeous dress! I love love love the neckline. Pairing it with the yellow belt adds a nice touch. Oh solvi!!!!! You have done this vintage pattern such justice….it’s perfect, the rick rack of course caught my eye too, but the fabric also has something vintage about it. You wear it beautifully too…nice accessorising. Gosh…I could swoon even more, but just know hat I have severe sewist envy, wishing I’d made such a beauty. Your dress is beautiful, I love the shape and the fabric. what a terrific dress! i love the color and how versatile it is with color pairing (teal, mustard and pink sounds tremendous!!) congrats to your beau!! Thanks! I really want to make a pink belt, that´s for sure! Looks great! Love it with the yellow belt and LOVE the neckline detail!! You’re rocking it! It’s gorgeous! I absolutely love the shape. Great idea to stiffen up the pleats. Thanks! 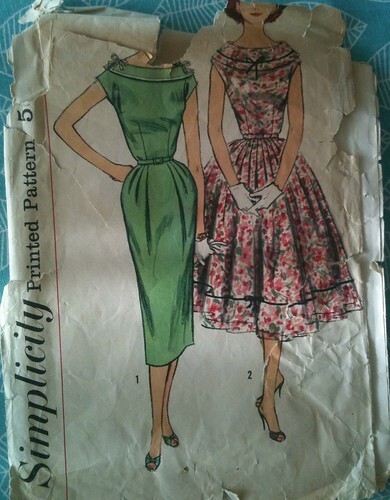 Those vintage pattern makers have some cards up their sleeves that you just don´t get from the modern ones! What a beautiful dress-I love brown also, and while I gravitate to black in the cooler months, brown is wonderful year round. I like the dress paired with the gold belt. Congrats to your husband on his PhD. Wonderful! I’m a fan of brown, too. I love black, but get bored of it sometimes. And brown really looks better on me anyway. 🙂 I hope your teal accessories re-appear–they look great with this dress.